Mention to any fan of the American musical theater the musicalization of Stephen King’s novel “Carrie” and I guarantee you will enjoy a visceral response; anything from the lift of an eyebrow to a physical readjustment of the entire body-frame will indicate their awareness of, and feelings regarding, the Michael Gore/Dean Pitchford/Lawrence D. Cohen show. 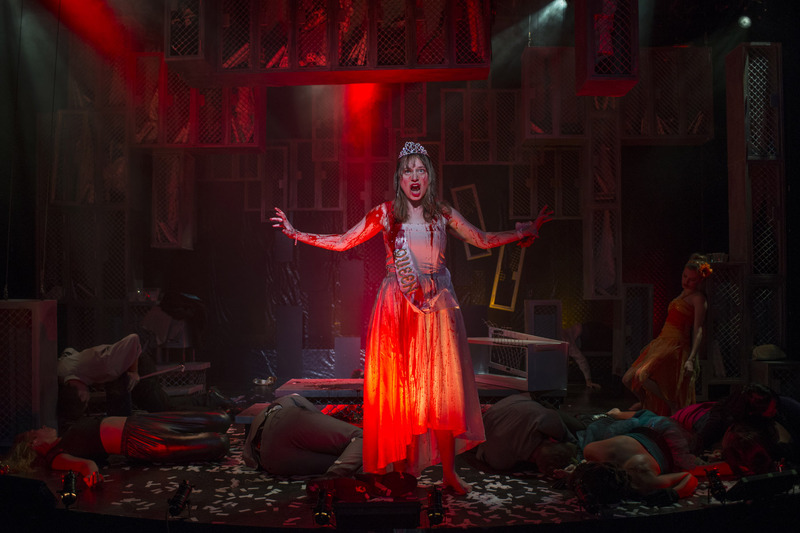 A little background: according to The Huffington Post, “Carrie” closed in 1988 “after five regular performances, lost $8 million and became the most expensive flop in Broadway history at the time.” The reverential mounting by Bailiwick Chicago belies the piece’s subsequent camp-cult status. Aside from a few laughers, the audience took the show quite seriously on the night I saw it. However, director Michael Driscoll and his production team did not lift it from its prom-night blood and ashes. Hampered by a pop-rock score that offers mediocre melodies with the occasional musical hook, repeated without reinstatement or change in meter, key, or even lyrics, and a book that can’t decide whether it is telling the story of a family-life gone horribly awry or a high-school experience rife with interpersonal dreadfulness and finding itself unable to tell the two stories at the same time (the success of which might have saved the entire debacle), only solid delivery can save this show. How can a story resonate with an audience engaged in a discussion of bullying and gun control, where the bullied telekinetically murders both her foes and her allies, knifing the audience anew with never-to-be-erased pictures of schoolchildren dead from high-powered weapons? Carrie herself mentions desiring vengeance in her first musical moment, losing potential sympathy, and the character of her friend Sue is insufficiently highlighted at the top of the piece, and then over-studied in Act II; at first we miss her as the Everyman she might portray, as our window in, and later we wish she would shut up about her boyfriend so we could get to the prom. Bailiwick Chicago at Victory Gardens, 2433 North Lincoln, (773)871-3000, bailiwickchicago.com, $40. Through July 12.